PARIS – After training a network of telescopes stretching from Hawaii to Antarctica to Spain at the heart of our galaxy for five nights running, astronomers said Wednesday they may have snapped the first-ever picture of a black hole. It will take months to develop the image, but if scientists succeed the results may help peel back mysteries about what the universe is made of and how it came into being. “Instead of building a telescope so big that it would probably collapse under its own weight, we combined eight observatories like the pieces of a giant mirror,” said Michael Bremer, an astronomer at the International Research Institute for Radio Astronomy (IRAM) and a project manager for the Event Horizon Telescope. “This gave us a virtual telescope as big as Earth—about 10,000 kilometers (6,200 miles) is diameter,” he told AFP. The bigger the telescope, the finer the resolution and level of detail. The targeted supermassive black hole is hidden in plain sight, lurking in the center of the Milky Way in a region called the Sagittarius constellation, some 26,000 light years from Earth. Dubbed Sagittarius A* (Sgr A* for short), the gravity- and light-sucking monster weighs as much as four million Suns. Theoretical astronomy tells us when a black hole absorbs matter—planets, debris, anything that comes too close—a brief flash of light is visible. Black holes also have a boundary, called an event horizon. The British astronomer Stephen Hawking has famously compared crossing this boundary to going over Niagara Falls in a canoe: if you are above the falls, it is still possible to escape if you paddle hard enough. Once you tip over the edge, however, there’s no going back. The Event Horizon Telescope radio-dish network is designed to detect the light cast-off when object disappear across that boundary. 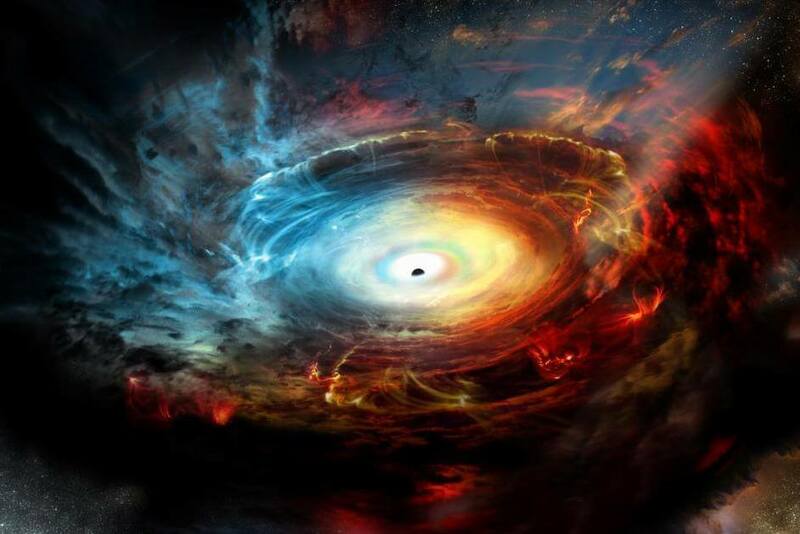 “For the first time in our history, we have the technological capacity to observe black holes in detail,” said Bremer. The virtual telescope trained on the middle of the Milky Way is powerful enough to spot a golf ball on the Moon, he said. The 30-meter IRAM telescope, located in the Spanish Sierra Nevada mountains, is the only European observatory taking part in the international effort. Other telescopes contributing to the project include the South Pole Telescope in Antarctica, the James Clerk Maxwell Telescope in Hawaii, and the Atacama Cosmology Telescope in the desert of northern Chile. All the data—some 500 terabytes per station—will be collected and flown on jetliners to the MIT Haystack Observatory in Massachusetts, where it will be processed by supercomputers.